As our 2016 holiday season approaches, we find it also fitting to take a moment to remember an extraordinary twentieth century life that touched countless individuals and families representing every nation on earth. In the half century since Walt Disney’s passing on December 15, 1966, there remains a deepening desire to understand the motivations and aspirations of this exceptional man. In the final decade of his life, Walt Disney had reached a unique place of worldwide recognition and acclaim. 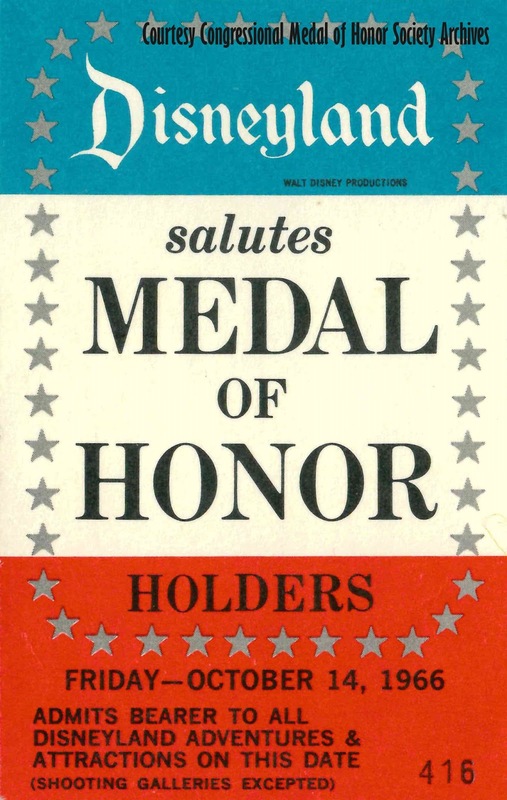 Among the honors that gave him a deep sense of pride was the George Washington Medal of Honor, presented to him on February 22, 1963 by former President Dwight D. Eisenhower on behalf of the Freedoms Foundation at Valley Forge. 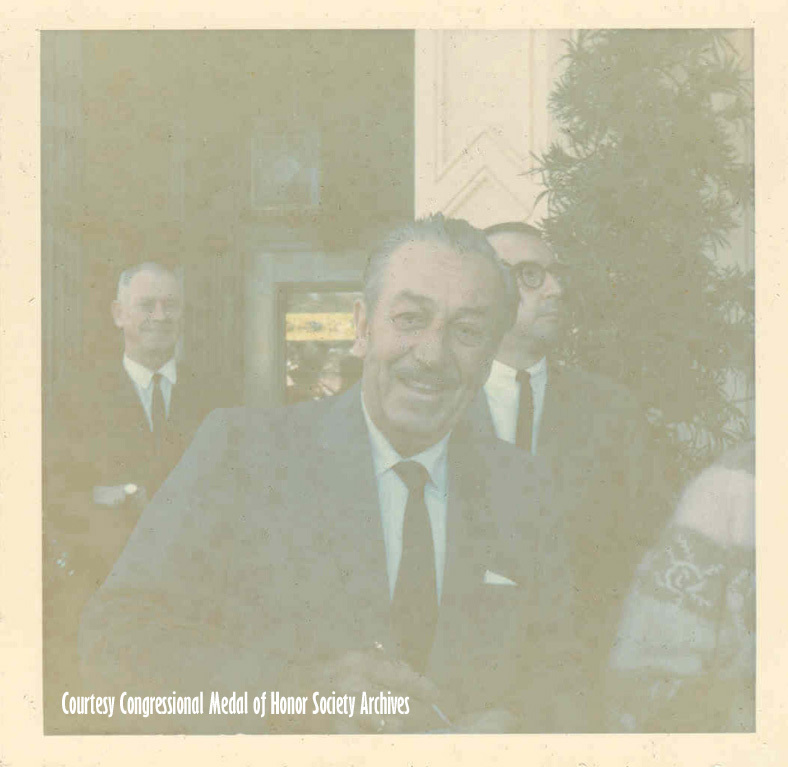 In receiving that award, Walt noted that “…it’s only times like this that you sort of wake up to the fact that… what it really means to be a citizen.” This high-water mark in his life set into motion an idea that would require several more years to realize. Congressional Medal of Honor recipient Col. Charles P. Murray, Jr. (1921 - 2011) and his wife Anne are photographed with Mickey Mouse in Town Square at Disneyland on October 14, 1966 (in front of the Bank of America). Additional information about Col. Murray's Medal of Honor citation can be viewed on YouTube by clicking HERE. 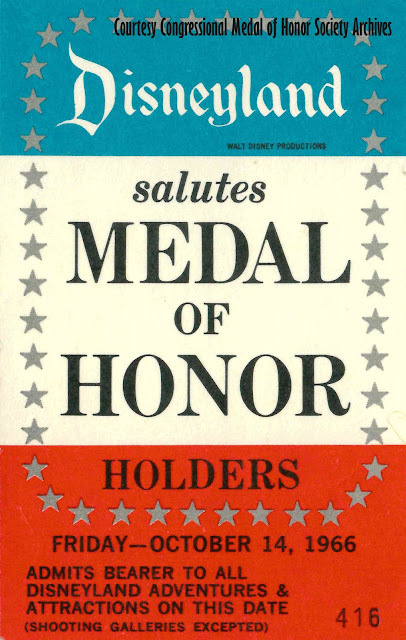 As the Freedoms Foundation prepared to recognize Walt Disney with their tribute, they were also focused on development of a “Medal of Honor Grove.” 52 acres had been set aside near Valley Forge National Park in order to provide one acre to each state in the nation for honoring their Congressional Medal of Honor recipients. For those who had receive the nation’s highest military award for valor in combat, Walt Disney believed that these were the true American heroes and he set a course to personally thank each of these exceptional individuals for their sacrificial service. 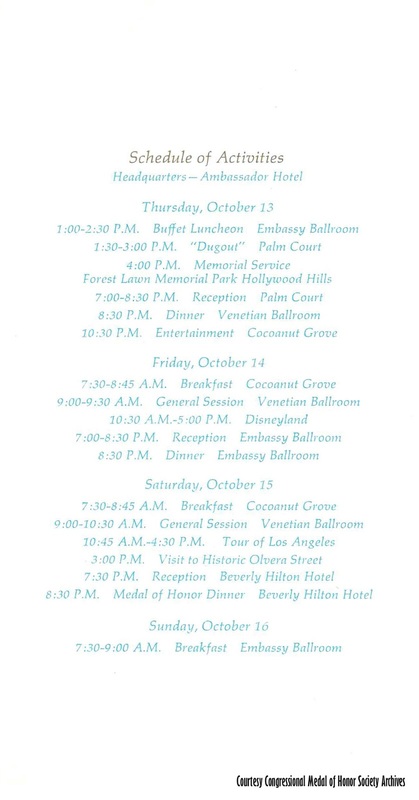 In association with Freedoms Foundation co-founder Dr. Kenneth Wells and the board of directors for the Congressional Medal of Honor Society, Walt’s plan began to take shape in 1966. He intended to host every living recipient of the Medal of Honor, along with their families, for a day of tribute at Disneyland. Though the Society typically held their annual conventions near the organization’s headquarters in Mt. Pleasant, South Carolina, consideration was given for the convention to be hosted west of the Mississippi for the first time in the organization’s history. 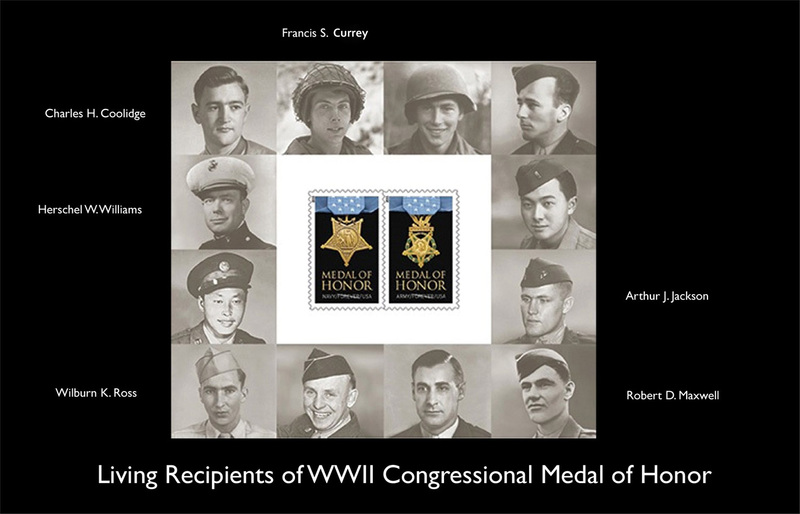 Many of the Medal of Honor recipients had homes closer to the Washington, D.C. region and a trip to California seemed to be cost prohibitive. Though the honorees were provided with free airfare on a “military space available” basis, until that time their wives were expected to pay their own expenses to the annual convention. In order to address that concern, the recently retired President and Chairman of the Board of Union Oil, A.C. “Cy” Ruble, arranged with the airlines to provide complimentary travel for all involved. 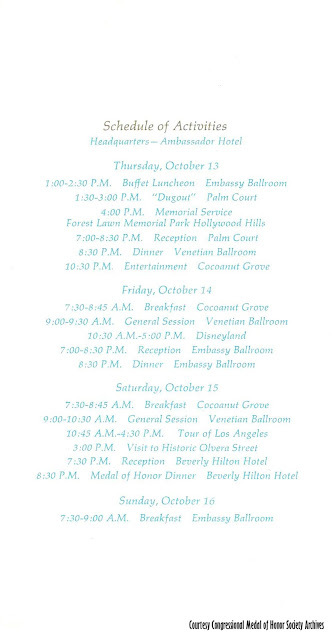 With that hurdle resolved, the convention was finally scheduled for the Ambassador Hotel in Los Angeles from October 13 thru 15, 1966. Among the many highlights of the convention was their visit to Disneyland on Friday, October 14. This was the moment that Walt Disney had long hoped would happen. His generation’s bravest soldiers, the Congressional Medal of Honor recipients, would now have a chance to experience his personal tribute to one of his own childhood heroes, the 16th President of the United States, Abraham Lincoln. Following the presentation, a microphone was placed in front of the stage in the center of the Lincoln Theatre and the audience welcomed Walt Disney, who stepped forward to provide his own personal remarks on the day. Congressional Medal of Honor recipient Walter D. Ehlers (1921 - 2014) with son Walter "David" Ehlers Jr., daughter Catherine Ehlers, Walt Disney, and Mrs. Dorothy Ehlers. 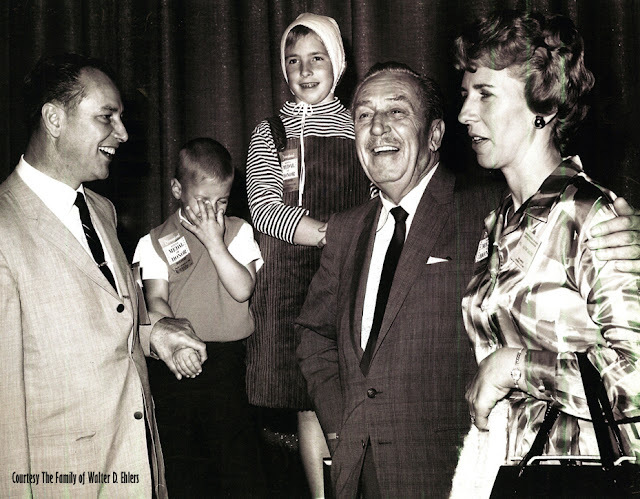 The Buena Park family met with Walt Disney at the conclusion of his personal remarks following the special presentation of "Great Moments with Mr. Lincoln." 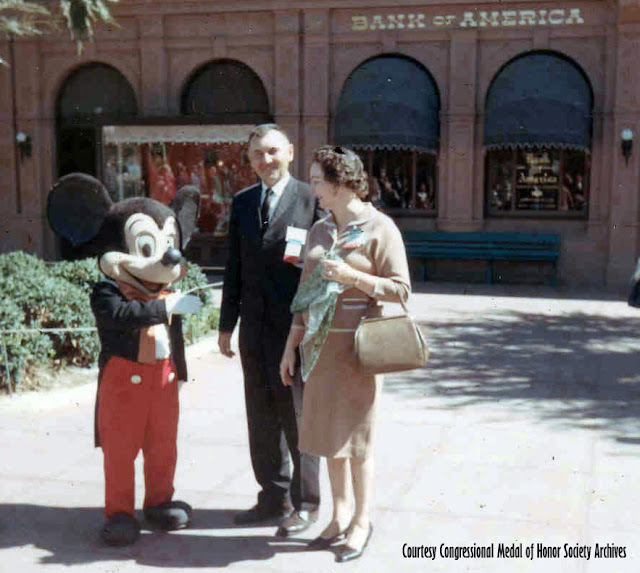 Ehlers would later serve as a Disneyland Security officer in the early 1980's. Additional information about Walter D. Ehlers' service to our country can be viewed on YouTube by clicking HERE. He explained to his guests that “Around Disneyland I’m the top kick. I run the show here. And I’m telling you that if they don’t treat you right… you report to me.” This was a reference quickly understood by his military guests. “Top kick” was a military reference to a first sergeant; or to another high ranking officer; likely first used at the conclusion of WWI. As Walt’s own service in the war (as an ambulance driver for the Red Cross) had taken place in that same era, it’s likely that he came to appreciate the significance of the term and remembered it for just such an occasion. This was followed by an amusing exchange between Walt and future President of Disneyland, Jack Lindquist (“Lindquist! Front and center!!”). Walt makes a point out of the day’s event ticket indicating that all attractions and amusements were included in their visit… “excepting shooting galleries.” Directing his comments to Lindquist, he notes that “Here we are… got Medal of Honor winners and we won’t let ‘em get up and shoot?! You got some slingshots you can let them take a crack at something with that?” Jack’s somewhat sheepish response: “That’s been rescinded. …the minute they leave here… they can spend the rest of the day at the shooting galleries.” The audience was quick to laugh along with another awkward moment and it was obvious that they were enjoying their unique place in observing the working relationship between Disneyland’s staff members and their world-famous boss. 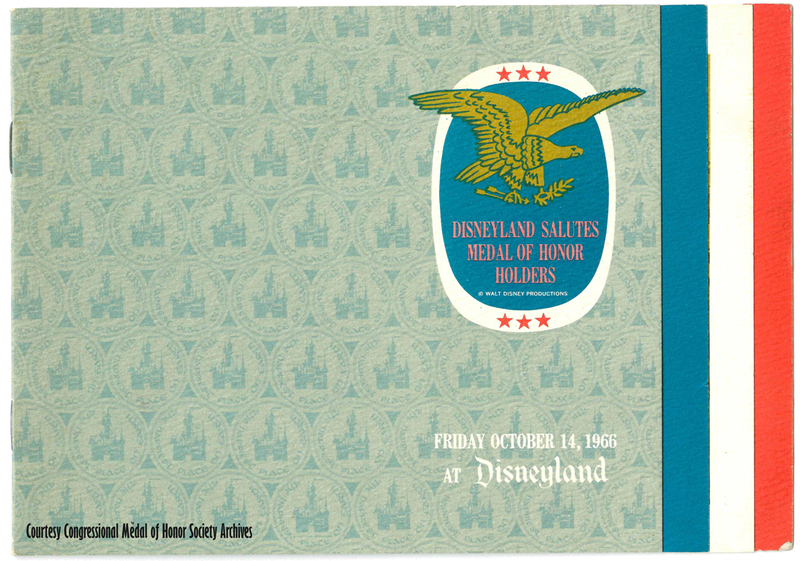 On what is believed to have been Walt Disney's final visit to Disneyland (October 14, 1966), he hosted the heroic men who had been recognized with the nation's highest honor for valor in combat: The Congressional Medal of Honor. Walt is pictured following the event with two key members of his Disneyland executive management team, Jack Sayers (L) and Charles Dargan (R). The photo was taken outside of Disneyland's Main Street Opera House by Col. Charles P. Murray and is among the last known photos of Walt Disney ever taken at Disneyland (and yes… he is signing an autograph). There was, and still is, near universal agreement in feeling that Walt’s best work was just beginning. Imaginations continue to work overtime in considering what Walt Disney might have been able to accomplish if only with ten more years. Now, even fifty years later, we understand that Walt Disney’s legacy includes an example of gratitude, kindness and consideration that still speaks to this generation and for all those that will follow. After the article was completed for publication, I received a telephone call from Charles H. Coolidge, recipient of the Congressional Medal of Honor (July 1945) and designated as a Knight in the Legion of Honor (also known as Chevalier de la Légion d'honneur) as belatedly awarded for his service in France during WWII by officials of the French consulate (September 2006). The courageous leadership of Technical Sergeant Coolidge during a four day battle east of Belmont-sur-Buttant in France would lead citizens of his home state to refer to him as "Tennessee's bravest man." Mr. Coolidge, now 95 years of age, confirmed that he was one of Walt Disney's honored guests on that October day at Disneyland in 1966. He remembered that Walt Disney "was a good host and he had dinner for us. We had a nice time and a nice chat. Everyone enjoyed it." He seemed to get more enthusiastic with each reminder that was provided to him about his trip to Southern California in 1966. "That's it!" "You've got it right!" "How wonderful!" 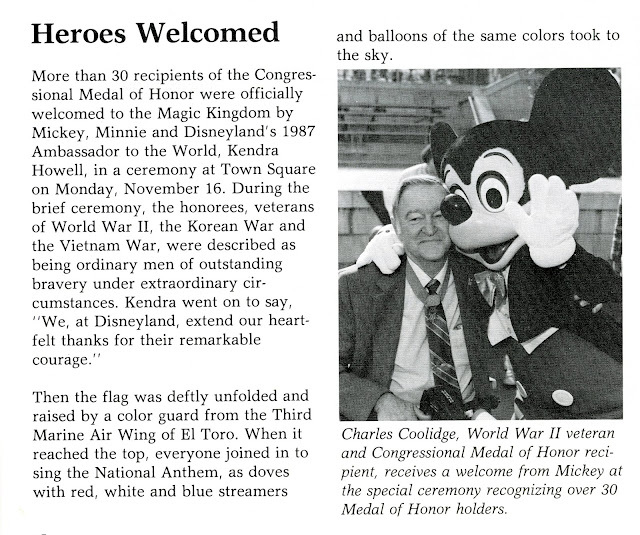 Two decades later (Nov. 16, 1987), Charles Coolidge was again invited to Disneyland along with more than 30 of his fellow Medal of Honor recipients as they were honored at a ceremony near the historic flagpole at Disneyland's Town Square. As he shared his earlier memories of their morning with Walt Disney, Charles Coolidge was as humble as he was grateful. For me, it was a privilege to have a conversation with this man who had risked all for the cause of freedom, not only for his fellow soldiers in battle, but for all freedom-loving people. It was also a tremendous honor to share a few words with Mr. Coolidge that could confirm how important their service had been to Walt Disney when he finally had the chance to offer his own personal tribute to these great American heroes. Yet from one Legion of Honor recipient to another, Coolidge remembered the extraordinary affirmation they had received from Walt Disney and he acknowledged its importance with a tribute of his own: "He did a great thing." It was a moment in time, now a half century ago, that Coolidge spoke of with a quiet and thankful heart; one that he hopes will be long remembered when future generations chronicle the life of Walt Disney. Dave Mason was born in Anaheim, California within a month of Disneyland’s grand opening premiere and dedication. Growing up in a community that celebrated every success of their adopted hometown “park", the stories of his family members serving as carpenters on Disneyland’s Sleeping Beauty Castle or sales clerks at the souvenir shops on Main Street, U.S.A. would provide for tales as wonderful as those found in Disney’s best storybooks. In fact, when Disneyland launched their summer fireworks extravaganza for the first time, the back yard of his family home on Anaheim’s Haster Street would serve as the perfect location to receive the best benefits of the Disney experience without having to buy an admission ticket. 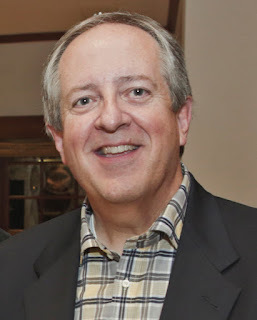 Today, Dave Mason serves as the founder of SaturdaysToys.com, launched on April 1, 1994 (yes, “April Fools Day”). Among the earliest entrepreneurs to make the leap into internet sales, Dave joined a handful of Disney enthusiasts in offering auctions on AuctionWeb (later to become known as eBay). In addition, Dave is honored to serve as the Director of Development with the all-volunteer team of The Annette Funicello Research Fund for Neurological Diseases (www.AnnetteConnection.com). He is a founding member of both the Walt Disney Family Museum and a global Disney research organization known as The Hyperion Historical Alliance. You can find all of Dave's articles here. As a big Disney fan and contributing writer here, native of South Carolina, and the son of a Vietnam Navy veteran who passed away in 2013, I enjoyed this article immensely. It was well-researched and really opened up a historical window into the Disneyland Park. It also built awareness of some things even I did not know about Walt Disney despite doing past research with many biographies and films based on him. Finally, I was enlightened about Mt. Pleasant, S.C. and its role in honoring those who served. By the way, they picked two great locations to honor those folks. Disneyland is, of course, extraordinary, but Mt. Pleasant, S.C. has Patriots Point, which is open to the public and allows for tours of historic air craft carriers, etc. Great job on the story, Dave, and great job editing it, Keith! I have posted on Facebook about your latest series too, Keith. The articles on the foundation of Disney World really bring back memories! What a wonderful article. I had always wondered about Walt Disney's final visit to Disneyland. Thank you for writing and posting this piece. Dave - thanks so much for this wonderful tribute to Walt Disney! It is hard to believe that this year will mark the 50th Anniversary of his death in December 1966. 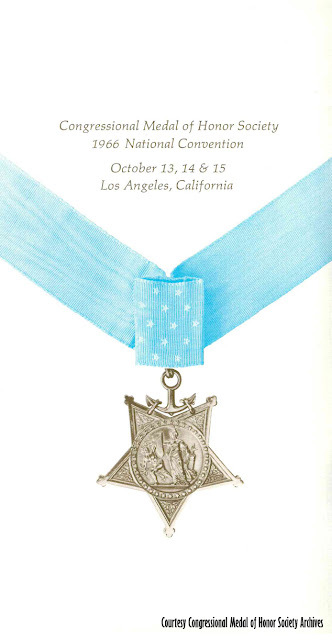 What a fitting tribute to the Medal of Honor winners and to Walt. It certainly makes me proud to be an American Citizen! The bit about the shooting gallery being off-limits for these heroes is priceless. Dave Mason is a true Disney treasure and one of the most knowledgeable and accurate writers about early Disneyland. I still anxiously await his long announced Merchants of Main Street book. Great article and a wonderful example that there are still so many Walt stories to be told that have never been told before. Very moving article. This was all new to me. Thanks, Dave, for telling the story. Thanks to Dave Mason's wonderful article, Walt Disney is still with us even fifty years after his passing! As long as we keep him in our memories, and hearts, he will be with us forever! Is there anyway to upload an image here? I have started a preliminary edit of the last photo of Walt at Disneyland. I still needs a lot of fixing but looks a lot better now. I have posted a copy of it on the "Vintage Disneyland" Facebook page in connection with this article. I am not the most experienced Photoshop user so I have a lot to learn to get it right. As that particular photo is part of a private collection, we'd ask that it not be altered and reposted elsewhere in order to maintain the integrity of the original image; as shown. Thanks for checking with us. John, we also edited the photo but decided to keep it as is. We ask that you please remove the photo from the Facebook page. If you would like to share the link where folks could find it and read the article that would be fine and much appreciated. The photo came from a private collection and the owners have asked that it not be shared apart from the article. Thanks for your understanding. Absolutely wonderful Dave. Thoroughly enjoyed this well researched and well written article. Sad and inspiring at the same time. From everything I have ever heard/read/discovered, Walt loved Disneyland and to think this was his last time to visit the Magic Kingdom, it's just really sad. I am forever grateful that there was a man named Walt Disney who made us all laugh, learn and be happy. Thank you, Dave. Wonderful article and very interesting to hear the details of Walt's last visit to his beloved Magic Kingdom, and more so, as he was in service to others and his country.